At first I thought this was nonsense but then quickly realised it became a derived class. I see a rock hard pinnacle thrusting skyward…and I see Rock Hudson with a weak grip on his own staff. But as far as I can tell, Derpysaurus doesn’t have teeth but badly chapped lips instead. @rev – is that the first object-oriented joke on GSS? Impressive. Is there an earth tremor going on? They all look unsteady on their feet. There’s a weird optical thing going on with that T-Rex. Is it big and far away, or tiny and right behind them? Man, do these people look like they hurt when they walk! Tag Wizard …look out … there’s a T. Rex … BEHIND YOU! I wonder if ol’ Gordon R. Dickson just sent people this blurb whenever he was asked for one. It’s notable that this phrasing could be interpreted to be somewhat backhanded. The young lady appears to be cobbled together by some amateur Dr Frankenstein: the right breast is enormous, the left merely large; whilst the legs have clearly come from different bodies. The model for the male lead appears to have been Benedict Cumberpatch on a bad day. The dinosaur is clearly drunk – it can’t stand up straight and appears to be trying to hide behind that palm tree. Looking the DAW editions on ISFDB I note the Dickson quote is the full version up to the Whelan cover only, but after that becomes just “unrivalled”: presumably because someone at DAW realised that being unrivalled in a class of one is not actually praise – and nor is being in a class by yourself! Dickson should probably win a prize for that quote. that ‘dinosaur’ has the largest, most muscular arms ever. far more so than when compared to its legs. perhaps they landed at the dino version of venice beach. or perhaps the standard beach dino is a beer swilling, iron pumping, roid popping ‘bro-asaurus dix’. all he needs is a tribal tattoo and it would be all but certain. @Don: I believe that the quote has been attributed to Abraham Lincoln, and possibly also Samuel Johnson, if you like attributing quotes to people, that is. @fom: those aren’t muscular arms per se so much as muscular shouldersâ€¦goodness, that dinosaur has a double rotator cuff! Yes, the blurb is familiar from our attempt to rationalise it on its last appearance. I notice, however, that it is punctuated differently here… and makes even less sense than it did the first time. Sorry, Gordon Dickson, you can’t fix your logic with punctuation. The quote’s even more incomprehensible if one has read the book. What, exactly, one asks oneself, *is* this class of which “Dinosaur Beach” is the unrivalled sole member? It can’t very well be “time travel stories” or “books with dinosaurs in them”. Because the cover of a book that’s in a class by itself needs a cover song that’s in a class by itself. 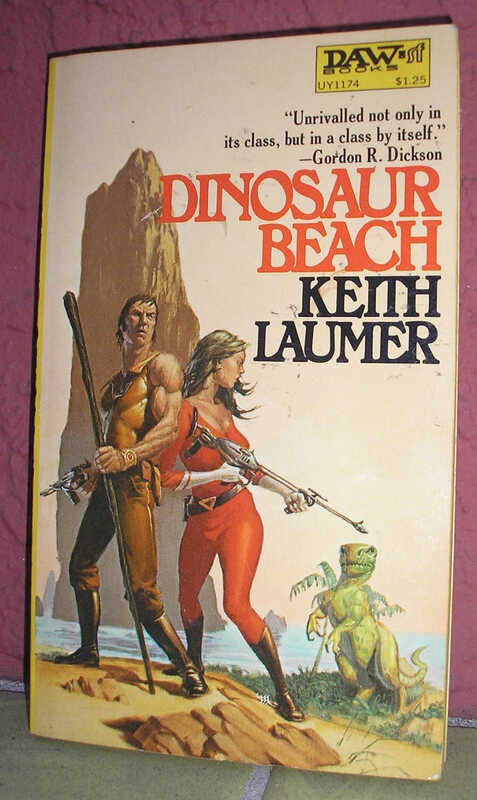 “Odyssey” is a Baen compilation that includes “Dinosaur Beach” among others. So really the Gordon Dickson quote only applies to part of that volume. So apparently the other stories are in a lesser and/or different class. Yeah I thought about Dinosaur Beach for my holidays this year, but the TripAdvisor rating was only 2 stars. Researchers are still debating what kind of sounds dinosaurs made. When it comes to this particular dinosaur however, my bet is on an inquisitive “Gwrrroinnk?”. – Gordon R. Dickson is currently out of the office and is expected to return next Tuesday. @Tag Wizard – Thankyou. I was concerned it was maybe too nerdy. Can I have an OOP tag? Please? Ah yes, I can already see the blurbs on the good Dr. J.R. Asimov’s next book. “L-look, look, it-it’s the same blurb but two different books! How can that be, plus, WTF does it mean in the first place?” We’d be putting ourselves at serious risk of bodily harm. But thanks to GSS, we can all nestle by the fire in our snuggies with a hot pipe and a hot toddy, basking in the glow of fellow travelers who get it . . . .
@ B. Chiclitz — You sir, are in a class by yourself! Which must mean your schedule got messed up again. @Biblioboyâ€”Ah, how well I remember being just a wee, wee lad and you taking me under your wing and explaining how I could be “outstanding in my field.” After twelve hours of standing out in that meadow I finally realized what it meant to be in a class by oneself. Cheers to you, Good Sir! @B.C. — All farmers are great because they are out standing in their field. And all Siamese twins are exasperated because they are standing there beside themselves. If it’s not the Germans, it’s the bloody dinosaurs.. If you think this beach is random, the adjacent island has Dracula, Tattoo and The Saint fighting over a laser pointer! Publishers Note: Odyssey has previously appeared in parts as Galactic Odyssey, Dinosaur Beach, and in the volumes Once There was a Giant, Greylorn and Alien Minds. This is the first combined edition. I’m curious if those other books are also sporting the Dickson blurb.